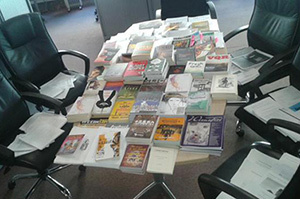 We've reached the seventeenth year of the Caine Prize for African Writing and our office is filled with a record breaking number of entries: 166 short stories from writers representing 23 African countries. Last year 153 qualifying stories were submitted to the judges from 17 countries. Our 2016 judges, who were announced in London last month, will meet in early May to decide on the shortlisted stories, which will be announced shortly thereafter. Once again, Blackwell Hall, Bodleian Libraries, in Oxford, UK, will host the Caine Prize award ceremony on Monday 4 July 2016. Want to know who will be judging this years entries? Meet our 2016 judges here.